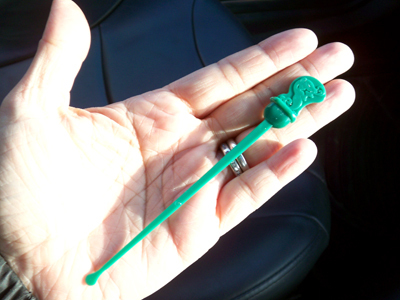 I was admiring Starbuck's new cup design with their older logo when Aaron pointed out what I thought were stirrers. "What strange little stirrers!" I thought. Then he showed me that these "stirrers" were actually little plugs for the sippy hole in the lid. What a great idea! I can't tell you how many times I have been transporting one or more cups of hot coffee only to have the coffee slosh out the little sippy holes all over me. One of our Starbucks even kept a scotch tape dispenser on the counter for people to tape the holes shut in an effort to stop the sloshing. I have seen Aaron unsuccessfully stuff a napkin in the hole on many occasions. Now we can use the little plastic pluggy thingys to stop up the cup lid sippy holes. Thats a GREAT idea. I wind up stuffing a tissue or napkin in it while im driving, and it winds up getting wet and falling apart into my coffee. We got them last year at a coffee house I worked for. When it closed down I made sure to grab a bag of them (with permission of course) for future coffee runs. I love them! Thanks as always for your great posts! That is really an awesome idea. I'm always making messes with cups like that! I remember seeing these a while back online for Starbucks in Japan and thinking, ok, so why don't they have them here, too! Fantastic! Now I'm definitely going to make a coffee run to see if my local has them! Not very green, although a nice idea I guess. How many zillions of these will be in landfills? anonymous - true... I thought of that, so I kept mine for next time. Maybe they could make them from wood like the stirrers? i was going to blog about those things today, too. :) they're pretty cool. although the picture on them looks more like a fire-breathing dragon/lizard than their mermaid logo. as for reuse, we told the boys that they could use them as puppets. Whenever I had more than one coffee cup, I'd ask for the little stickers that they put on coffee bags. I'd cover the holes with that. Those little plus are super cute, though! someone already had my thought that it's not very green. what's even more green is taking your own reusable mug! Our local coffee shop has little decals in different shapes (reindeer, hearts, doggies, starts, etc.) that you can stick over the hole. They're about the size and thickness of a dime, but made from thick paper or thin cardboard. Much more eco-friendly, plus you can choose which shape and color you want! As for the green...you can wash and reuse them. They are plastic so I wouldn't rewash them too many times but yes they can be reused. I do agree your own cup always surpasses the paper ones though. 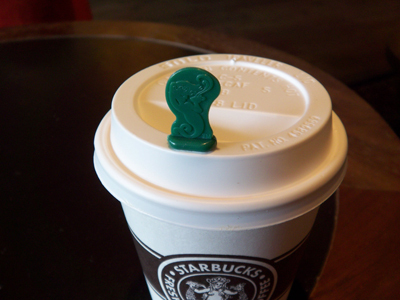 Is being able to plug the hole on the top of your Starbucks coffee really worth bringing more plastic into the word? Yes the best thing would be to bring your own cup, but there are always times you end up there and don't have a cup with you. I always take my paper cup home and recycle it. I am reusing the plastic sippy hole plugs (stuck one in my purse).